Willson’s Woods is one of the oldest parks in the county parks system. It was named for the former owner of the land, Charles Hill Willson of the Willson & Adams Lumber Co. It was acquired in 1924. The park is characterized by a beautiful bathhouse set along the local road that bisects the park. The bathhouse and one million-gallon pool were completed in 1928. The two-story bathhouse was designed in an English Tudor revival style and is presented in a striking mixture of brick, stone, wood and stucco. The grand entrance is marked by a large arch with stone voussoirs and two side portals. DeMatteo Pavilion. Excellent rental spot for birthday parties, graduations and other special events. 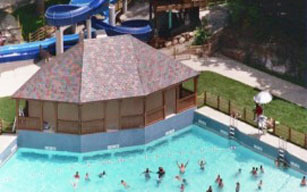 The park is well-known for its waterpark, Willson's Waves, complete with a wave pool where you can body surf on three-foot waves; splash downward on an 18-foot high water slide; wander through cascades and fountains in the water playground; or just cool off on the spray deck., water slides, a spray deck and water playground. The park also has areas for picnicking and fishing. Admission and fees: Proof of county residency required with either a County park pass or a valid New York State driver's license with a Westchester County address is required for admission. Dogs: Must be leashed. No dogs in picnic areas.